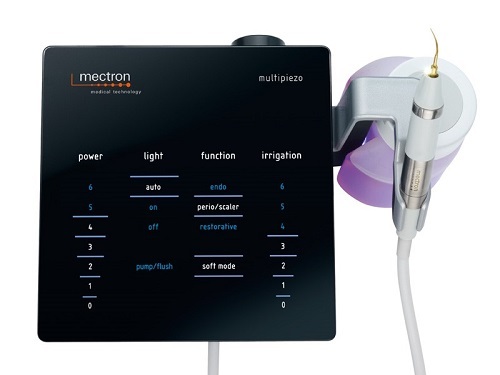 Whenever needed, Mectron’s innovative software switches the modulation of the ultrasound into its unique SOFT MODE and thus creates a gentle but still powerful insert movement. The result: treatment efforts are met perfectly – sensitive patients treated with maximum comfort. The PULSE MODE transforms the traditional sine wave formed ultrasound oscillation (standard function) to a new profile (level 6 of the restorative function), characterized by specific power peaks, which results in an optimized performance for extractions and prosthetics. The ergonomic touch panel of the new Multipiezo lets the user control all functions fast and intuitively. Due to its smooth touch surface, it can be cleaned and disinfected easily. Thanks to its innovative soft mode the Multipiezo also sets new standards in insert control and patient pain management.